Made from organic cotton, wool, and/or natural latex as a core, an organic crib mattress is a great investment to make in your baby’s health. Made from all pure materials, no synthetics or chemical flame retardants are used. The Naturepedic Organic Cotton Classic Crib Mattress offers everything you might need in a crib mattress. This crib mattress is built to last! It is made with a heavy duty innerspring unit that is covered in organic cotton batting and finished with organic cotton waterproof fabric. It is waterproof, firm and will provide your child with a more natural, healthy and comfortable sleep environment. Choose from 150 or 252 coils. The 252 coil mattress is slightly firmer and a great choice for use with a toddler bed. Weighs about 20 pounds. Approximately 27 1/4″ x 51 5/8″ x 6″. Certified organic by GOTS and is also Green Guard Gold certified! 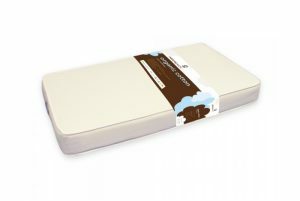 $259.00 – $299.00 Waterproof certified organic innerspring crib mattress. How to choose between natural rubber or innerspring for your organic crib mattress? Read our blog post on innerspring vs. rubber crib mattresses. 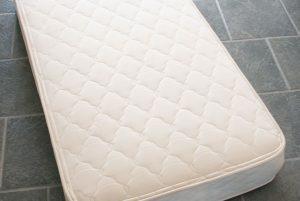 Natural latex/ natural rubber crib mattresses have a core of firm natural latex surrounded by a quilting made from wool encased in organic cotton fabric. The natural innerspring crib mattresses we carry are made with a firm coil unit surrounded by thick layers of organic cotton batting and an organic cotton and wool quilting (with the exception of Naturepedic, which uses PLA instead of wool). 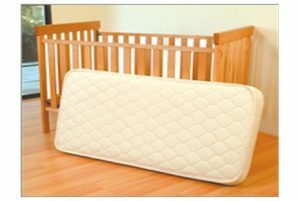 All of our organic crib mattress manufacturers are top notch and they are all high quality and well made. Both the natural innerspring mattress and the natural latex mattress are considered firm, and provide a supportive, comfortable feel for newborns through toddlers until ready to move into a big kid bed. None of our crib mattresses are treated with any chemical or non-chemical flame retardants, as the wool or PLA itself acts as a natural flame retardant. Most of these organic crib mattresses are all made from all natural materials, therefore, the mattress is not moisture resistant (with the exception of Naturepedic) and we suggest placing a wool moisture pad and a cotton mattress pad on the top to protect against leaks and accidents.